McGee: You and Zoe broke up? McGee: Why didn't you tell me? Tony: Well the break-up bug's going around. Didn't want you to catch it. Permalink: Well the break-up bug's going around. Didn't want you to catch it. Bishop: We're about to go live. What are you guys talking about? McGee and Tony: Star Wars. Sonja: Tony DiNozzo. Why does your name ring a bell? 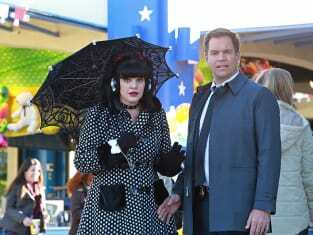 Tony: I'm kind of a legend in the NCIS world. Sonja: I don't know anything about that. I transferred from ATF. Tony: ATF? Ever work with Zoe Keates? Sonja: Yeah. Training exercises in Georgia. You two are dating! Tony: Ah. Well that's over now. Sonja: Well I hope for your sake she ended it, cause that girl was mean on the jujitsu mat. Vance: I'm thinking it's time we bring Tony Stark in for questioning. Vance: Iron Man. Smug. Tech mogul slash super hero. My son collects them. Gibbs: I guess now so do I.
Permalink: I guess now so do I.
Abby: Luca, this is very special Agent Tony DiNozzo. Tony, this is my little brother Luca. Tony: It's nice to meet you, Luca. You're under arrest. Permalink: It's nice to meet you, Luca. You're under arrest. Abby: She's a sleeper agent. And she's using you. Luca: Well she must have a good reason. Permalink: Well she must have a good reason. Abby: We are going after whoever murdered those people. Abby: After the last few days, how can you say that?